Bethelem Alemu Garden of Coffee founder. AFRICANGLOBE – Bethlehem Alemu, an Ethiopian entrepreneur and one of Africa’s most successful women, is unstoppable. After founding two very successful global businesses, Alemu has most recently launched Garden of Coffee in hopes of allowing the rest of the world to taste hand-roasted Ethiopian coffee. She is planning to expand to China where she is already set to open over 100 cafés! Ethiopia, considered the birthplace of coffee, is Africa’s — and even some of the world’s — largest producer of the finest specialty coffee beans. For generations, Ethiopians have also passed down unique, traditional crafting techniques in brewing coffee. Alemu, as an entrepreneur, has always been inspired to bring that magical experience to coffee lovers everywhere in the world. 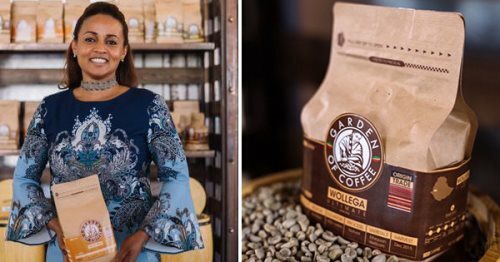 In 2016, she launched Garden of Coffee, a brand that uses artisanal methods to source, process, roast, and pack Ethiopia’s legendary coffee beans. Headquartered at Addis Ababa, Ethiopia, at least twenty artisans do the process by hand and create five types of coffee beans only for personalized orders that are shipped directly to over 20 countries including Russia, Sweden, Germany, and the United States. Not only does this personalized roasting make out the finest quality of coffee and reduce the ecological footprint from factory roasting, but it also promotes local economic growth through job creation. Through Alemu’s footwear brand SoleRebels, luxury leather brand The Republic of Leather, and coffee brand Garden of Coffee, she hopes to provide ecologically and economically sustainable jobs for her community. To further expand, Alemu has launched Garden of Coffee in China, jumping at the opportunity brought by the increasing demand for specialty coffee in the then tea-loving Chinese market, alongside with Starbucks, Coca-Cola, KFC, Alibaba, among others. In line with that, Garden of Coffee will reportedly ship 12 tons of hand-roasted coffee to China in the first year through Suzhou Reyto trading company. Their social media advertisements also hint on soon placing their products on the shopping site, Taobao. Garden of Coffee is also set to open over 100 café roasteries across China by the year 2022. Customers will also be able to receive their coffee through a subscription service every two or four weeks. With China’s fast growing economy, Alemu is hoping that this move will bring about the “fourth wave” of coffee evolution, whereas it focuses more on long-term sustainability and promoting and preserving local ways of farming. With the increasing demand, Garden of Coffee is expected to increase its artisan workers to 300 by the year 2021.